How to care for your hair in the winter? Beautiful, bouncy and shiny hair is a women’s crowning glory. But winter can leave them dry, frizzy and brittle. If you too are worried about winter hair damage, then here are some hair care tips that might help you maintain healthy, beautiful hair all season long. Think bad hair days are over after summers? Not really, the wintertime is no less challenging for your hair. If the glaring sun and salty water in the summers can make hair unmanageable and frizzy, chilly weather comes with its own set of hair woes. Whipping winds, static electricity, dry air and freezing temperatures can not only make hair rough and brittle, but also it can increase hair loss. Things can be further worsened by central heating indoors that strips moisture from the scalp, leaving it itchy and dry. The best way to protect your hair from snow, rain, and icy cold wind is to keep them covered. A stylish hat can be the perfect accessory for your outfits this winter. A hat is not only a trendy accessory, but it can also be a perfect way of concealing your hair on a bad hair day. Fedora, beanie and woollen turbans are a few fashionable hats that are a must have this season. Worried about hat hair? Use a silk scarf to wrap your hair before putting into a hat. This will cut down static electricity and will also protect your hair from being squished by the hat. Using hairspray to reinforce your hair can also prevent them from being rubbed and squished by your hat. Cold winds outside can snarl hair and indoor heating can strip them off the moisture. Treat your hair once a week with a deep conditioning treatment to restore the moisture in your locks. 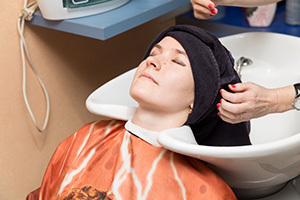 Deep conditioning can repair dry and frizzy hair, making them healthy, smooth and shiny. Don’t want expensive salon treatments? No need to go for salon treatment as you can easily give yourself a professional treatment from the comfort of your own home. Shampoo your hair using a moisturising product and follow with conditioner. Apply the conditioner by making sections in your hair. Now put on a shower cap and tuck all hairs in it. Throw a wet towel in the microwave and wrap it around your head. After 20 to 30 minutes, rinse your hair using cold water. Your hair care routine must change according to the weather. While it is advised to shampoo frequently in the summers, you must do the exact opposite in the winters. Don’t wash your hair more than twice a week and use a conditioner every time. It is better to use a leave-in conditioner as it will lock the moisture in your hair. You can also include a hair mask into your weekly routine. Got split ends? To tame split ends, start using natural oils before shampooing. Argan oil or hot coconut oil can be really beneficial for your hair and scalp health. Regular trims can also help get rid of dry ends. To further reduce hair damage, limit the use of heated styling tools like blow dryers and curling irons. If you still want to use them, then don’t forget to apply a good quality heat protect spray before styling.